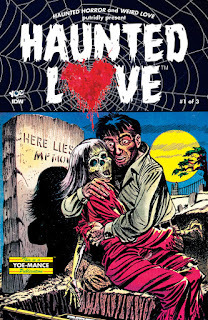 The Fellowship was fortunate enough to obtain a copy of HAUNTED LOVE #1 from Yoe Comics and IDW Publishing. Credits are iffy, as this is a collection of stories from the 1950s. A young woman is taught witchcraft and hatred of all men, only to find true love and then lose it horribly. The wife of the ice plant’s owner falls for the ice delivery man, and together they meet a chilling end. A zoo owner falls for a mystery woman, a real maneater. A woman falls in love and marries, only to learn that her husband is Death, and she can only die when he tires of her. And these are only the beginning. This book is a collection of short stories culled from the horror comics of the 1950s, and this particular group are those involving some degree of romance. I have always found it interesting to go back into history to see where things started to get a sense of how they have progressed. And these stories are fascinating in the simplicity of the stories and in the creepiness of the horror aspects. Clearly things have changed, but maybe not as much as you might think. These stories are a great look at where comics came from and how they’ve developed over the years. And honestly, some of them are downright scary. Check it out for yourself. HAUNTED LOVE #1 is available now at your FLCS, at yoebooks.com or at idwpublishing.com.